No matter where you are in your guitar playing right now, there is one thing that will dramatically accelerate your guitar playing progress and maximize your motivation to learn, practice and play guitar. What you need to do is: start tracking every element of your musical progress on a regular basis. Most guitarists are naturally skeptical that something as simple as “tracking their progress” can make a massive difference in their ability to reach their musical goals. They think that musical progress can only occur from practicing new guitar exercises or learning more new things about guitar/music…and they are wrong. Want proof? Read this report about improving your guitar speed to see how (and why) guitar players who track their progress make up to 35.8% more progress in their speed compared to those who do not. By failing to monitor your progress, you never know if you are on track to reach your musical goals and how effective your practicing really is. Without these insights, many guitar players become easily distracted with “shiny objects” - new exercises, guitar licks, tricks, ideas and concepts that pull you even further away from your primary guitar playing goal(s). In contrast, those guitarists who do track progress regularly with all of their musical skills know exactly how their playing responds to every item they practice. As a result, they can continue doing more of what is working and refine or replace the things that aren’t working. This increased efficiency that comes from tracking your progress enables you to reach your goals faster. 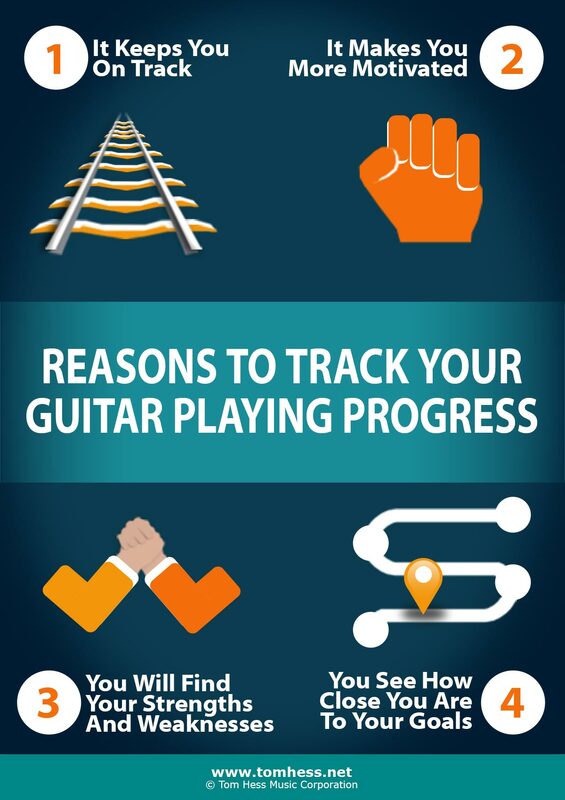 Incidentally, the advantages of tracking progress are not exclusive to musicians only. Imagine what would happen if students in schools learned without receiving grades in the subjects they were studying...or if cars were designed without tracking, monitoring and optimizing their performance. Answer: students would have no way to assess the results of their studying and would lack motivation to improve their academic achievements. Likewise, cars designed without paying attention to key metrics of safety and performance would certainly become a whole lot more dangerous to drive. Tracking and monitoring of progress is mandatory for top performers in virtually every area of life …and it is just as critical for guitar players who want to reach their goals faster. 1. You will feel a lot more motivated to practice guitar (because you know that you will become a better guitarist each time you pick up your instrument). 2. You will become addicted (in a good way) to practicing and continuously reaching higher levels in your guitar playing. 3. Points 1 and 2 will reinforce each other, creating a self-sustaining musical progress loop that makes you a better guitarist even faster. 1. The big picture level - which shows you a bird’s eye view of how different musical skills are improving. For example, you may track your progress with guitar technique, music theory knowledge and fretboard visualization and see how your overall skills improve in each area. This is the “big picture level” of progress. 2. The microscopic level - which breaks down the bigger musical skill you are tracking into many small elements that together form your overall skill level. This tells you not only where you are with the specific skill you are tracking, but WHY you are at the level you are and what you must do to progress past your current limitations. For example, in this free report about building guitar speed you can see the main skill of “guitar speed” broken down into 6 elements of guitar technique. When these 6 elements are practiced, tracked and mastered, your overall maximum speed will go through the roof. Tracking your musical progress is like having a detailed map guiding you towards your guitar playing goals. When you know exactly what you need to do every day to become a better guitarist, you develop a great sense of confidence in your potential to reach your musical goals. Now that you know the benefits of tracking your guitar playing progress, take action to learn how to monitor your musical skills and begin doing this as part of your practicing on an ongoing basis. To learn more about the specific areas you should be tracking in your guitar technique, get this free report about increasing your guitar speed and apply the advice within to turbocharge your guitar playing progress. Get the secret weapon that will boost your guitar playing progress.